Divalicious Chocolate! Fountain Rentals can provide the dipping items for your event. You can also get them yourself or procure them through your caterer, event planner or venue. Divalicious Chocolate! offers a choice of a Basic or Customized Dipping Item Packages. We provide approximately two of each item per person. If you would like a more elaborate selection of dipping items, we can provide additional items depending on your choices. 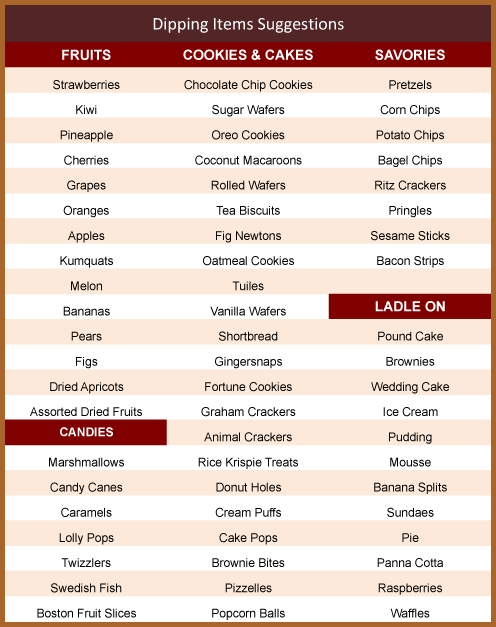 Please refer to our Dipping Items Suggestions list below for inspiration and reach out via our contact form or call us for a customized quote, 929 277-9175. PLEASE NOTE: we list all the things we think work best in a chocolate fountain. Depending on availability, we may not be able to supply all the items on the list. We reserve the right to make substitutions if your choice is not available or in poor condition. Due to varying themes and decor for events, we do not provide platters for the dipping items. We can advise on the number of platters that will be needed based on your dipping item choices. Parties of 125 or more persons will incur an additional $75.00 delivery charge for the dipping item packages.